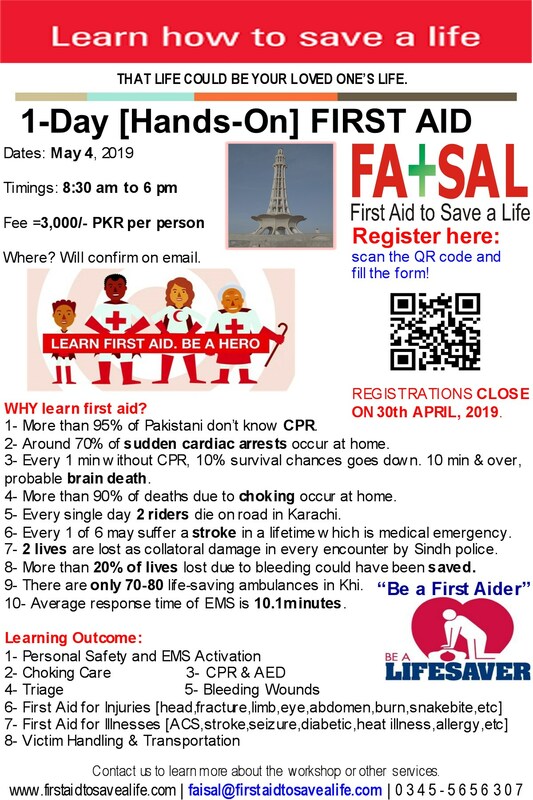 First Aid to Save a Life (FATSAL) Pakistan is pleased to announce their upcoming “CPR, AED & First Aid” International Training Certification Course in Islamabad on February 02, 2014 at Hotel Pak Continental. This entry was posted in 1-Day Training Programs, Advanced First Aid, AEDs, Basic First Aid, CPR and AED, emergency care and first aid, Emergency First Aid, First Aid, First Aid and CPR, First Aid CPR and AED, First Aid Training Programs and tagged 2013, 2014, 2014 training course, accredited training courses, accredited training program, advance first aid, AED, aed training, aed training programs, aed trainings in pakistan, AHA First Aid Training Courses, American heart association, american red cross, anti snake venom vials and pressure bandage, anti-snake venom vials, ARC First Aid Training Courses, automated external defibrillator, basic first aid, basic life saving skills, can i participate free of cost in a training program, can i participate free of cost in any of training this year, Cardio Pulmonary Resuscitation, certification, closed chest compressions, community services, community training courses, control of bleeding in snakebites, conventional CPR training vs online CPR class, courses, CPR, CPR and AED for Adults, cpr training, cpr trainings in lahore, defensive driving, defensive driving training companies, defibtech aed, discount, discount offers, discount offers on trainings, emergency first aid, ERC, faisal, faisal javed, faisal javed mir, fire safety trainings, fire safety trainings in hyderabad, fire safety trainings in Islamabad, fire safety trainings in Karachi, fire safety trainings in Lahore, fire safety trainings in Peshawar, fire safety trainings in Quetta, first aid, first aid companies, first aid courses in islamabad, first aid to save a life, first aid to save a life pakistan, first aid to snakebite, first aid to snakebites, first aid training, first aid training course, first aid training courses in hyderabad, First aid training courses in islamabad, first aid training courses in karachi, first aid training courses in lahore, first aid training courses in multan, first aid training courses in peshawar, first aid training providers, first aid training requirements as per industrial safety laws, first aid training requirements as per local pakistani laws, first aid training requirements in pakistan, first aid training requirements suggested in pakistan laws, first aid trainings for free, first aid trainings in islamabad, first aid trainings in karachi, first aid trainings in lahore, free first aid courses, free of cost aed training courses, free of cost cpr training courses, free of cost first aid cpr and aed training classes, free of cost first aid cpr and aed training courses, free of cost first aid cpr and aed training programs, free of cost first aid training courses, free of cost training courses in faisalabad, free of cost training courses in hyderabad, free of cost training courses in islamabad, free of cost training courses in karachi, free of cost training courses in lahore, free of cost training courses in multan, free of cost training courses in pakistan, free of cost training courses in peshawar, free of cost training courses in rawalpindi, HAINES Position, Hands-Only CPR, how i can participate free of cost in training courses, how to prevent cardiovascular diseases, hse companies in pakistan, hse courses in islamabad, hse courses in karachi, hse courses in lahore, hse courses in multan, HSE courses in pakistan, hse courses in peshawar, hse training courses in islamabad, hse training courses in karachi, hse training courses in lahore, HSE training institutes, iirsm, ILCOR, incident investigation, international certification courses, international courses, international training courses, islamabad, ison, Karachi, Lahore, latest, medic first aid, MEDIC FIRST AID training programs, medic first aid trainings, MFA, nebosh, new courses launched in 2014, occupational safety training, occupational safety training companies, occupational safety training institute, occupational safety training institute pakistan, ohsas, ohsas pakistan, online CPR training, osalp, Pakistan, ppe suppliers from hyderabad, ppe suppliers from islamabad, ppe suppliers from karachi, ppe suppliers from lahore, ppe suppliers from multan, ppe suppliers from pakistan, ppe suppliers from peshawar, ppe suppliers from rawalpindi, rawalpindi, red cross, regulatory training requirements in pakistan, safety training institutes, ssc, sudden cardiac arrest, tourniquit and snakebite, training, training calendar, training calendar 2014, training calendar for 2014, training companies, training companies in pakistan, training course, training courses, training courses in karachi, training courses in lahore, training institutes, training program, training sessions, trainings, upcoming, why first aid training is necessary. Bookmark the permalink.